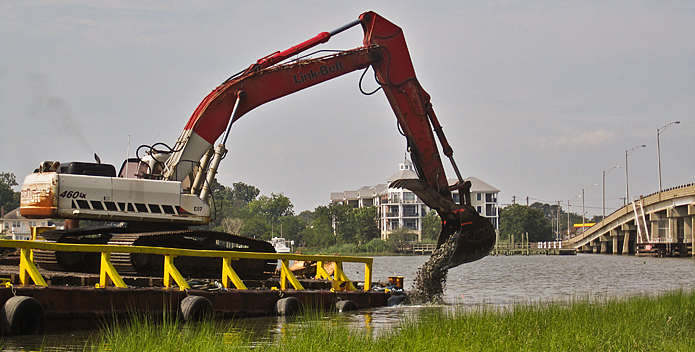 Oyster reef construction on Virginia's Lafayette River, done in partnership with the Elizabeth River Project. Tax dollars at work. It's a sign you occasionally see at road construction projects. But it also could be affixed to any number of valuable government services we take for granted as we sail, motor, fish, or swim in the Chesapeake Bay. Say you are a recreational boater and you spy dark clouds building on the horizon. You need real-time information on weather and water conditions. You pick up your smart phone or device and presto, the information is provided through the Chesapeake Bay Interpretive Buoy System. You are a livestock farmer who wants to raise animals the way your grandfather did—on pasture. You've seen the economic data; you know you can increase your profit margin making the switch. But it's expensive. So, you pick up the phone and secure some financial help from the Regional Conservation Partnership. These are just two examples of countless services provided by federal programs. The buoys are funded through the National Oceanic and Atmospheric Administration (NOAA), part of the U.S. Department of Commerce. The farmer program is funded through the U.S. Department of Agriculture (DOA). By now most people have heard that President Trump wants to eliminate all funding for the Chesapeake Bay Program, one of the biggest federal efforts that help the Bay. But there are many other federal programs that benefit the Chesapeake, NOAA and DOA programs being two. Some seem relatively safe from the budget ax; some seem in danger. Congress will decide the fate of all these programs this summer. 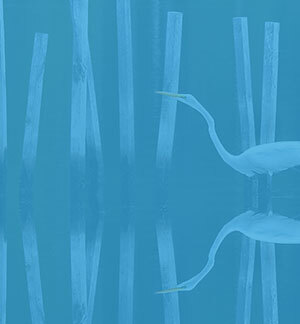 The Chesapeake Bay is an ecosystem, a complex network of living creatures. Three hundred years ago the Chesapeake didn't need help from the federal government to sustain itself. But there weren't 17 million people living within its drainage area. Human beings are hard on nature. Today, federal tax dollars from those 17 million residents are part of the complex econ-system (my word) that keeps the Bay alive. One dollar contributed from the feds prompts local governments, businesses, and groups to contribute up to $4 more to the same Bay-saving project. That's how you stretch tax dollars, create jobs, and boost the local economy. Your federal tax dollars are invested. They pay off. For instance, the feds gave $114,850 to restore 20 acres of oyster reefs in the Tred Avon River. That investment prompted the Oyster Recovery Partnership to raise $300,000 for the same project. Another example: the feds invested $54,320 for the restoration of 27 acres of wetlands on the Chester River. The money leveraged a contribution from Chesapeake Wildlife Heritage of $53,500. Take the federal dollars away, and re-direct them say, to the military budget, and the Bay will decline. Make no mistake about it. It's doubtful that individual states, counties or municipalities within the Bay region would raise their taxes or shortchange other programs to make up for funding lost through federal budget cuts. Oyster Restoration: From larvae produced at the Horn Point Laboratory in Cambridge to the giant man-made reef networks in the Choptank River tributaries, NOAA provides substantial funding for the herculean task of bringing back the Chesapeake oyster population. Oyster Aquaculture: Just like regular farmers get help from the federal government, oyster farmers in the Chesapeake get assistance from NOAA, especially in the form of research of what works best. Environmental Education: If we are to save the Bay, we absolutely must educate the next generation to carry on the work. Students across Maryland are monitoring and caring for streams near their schools, growing baby oysters, and studying their watersheds, among other actions. President Trump wants to eliminate a key environmental education program funded by NOAA: Bay Watershed Education and Training (B-WET). What might be lost? One example of many: the Choptank Choices program by the Sultana Education Foundation allows 5th-grade students in Caroline, Dorchester, and Talbot counties to study the Choptank both in the classroom and aboard the 1768 schooner Sultana. Bottom Sonar Scans: These provide the data for navigational maps used by recreational and commercial boaters. The science also locates hard bottom where oyster reefs can be created. Oyster Reef Monitoring: Every year in Maryland NOAA provides about $130,000 so divers can carefully monitor whether man-made reef systems are working. These monitoring programs tell us if oysters are surviving, reproducing, and more. Without these NOAA-funded dive, we'd be pouring tax dollars into the water with no way of determining results. Eastern Shore Congressman Rep. Andy Harris sits on the House Appropriations Committee and will have an important voice in the future of these and other Bay-related programs.